Give us a concept, which might be motivated by one of these: A theme, sizes, shapes, fabrics, paint chips, wallpaper, photos of a painting, and digital photos of your room. The concept might be some or all of these. The more information that you give us, the accurate will be our vision of your dream rug. The R.F. 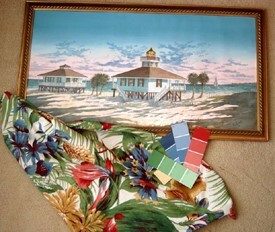 Williams painting of Boca Grande Light House, Paint chips of colors used in the Living Room and Dining Room, and the colorful floral fabric with a burst of colors were central in the creation of the two designs. The client expressed a desire for rugs with a white field as a dramatic contrast to the rich blue wall color. They also wanted the design of the living room rug to work around the furniture arrangement, so using the designer’s scaled furniture layout drawing created the design. A hand drawn line drawing was first for client approval, followed by computer renderings of both rugs, then corner samples of the rugs also approved by the client. The corner sample of the 60 knot custom rug woven in Nepal is what you see before the final production of your custom hand made rug. 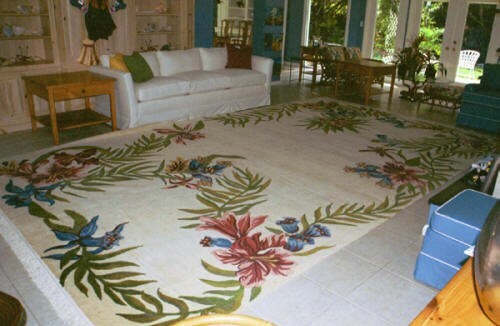 Large size rugs such as this 11 foot by 14 foot rug are often impossible to find. Custom sizing and colors to your exact specification are exactly what we are about. Review the Delos product page on this site (COMING SOON), which features a collection of their newest designs. Next, click their web link to view a large selection of Delos Rug Designs. On their site you may select the design, shape, and colors from their pop up pom box, and print a copy. Contact Art and Rugs by Design for custom rug designs, samples, and yarn colors, and we will assist you with the process. Review the Glen Eden product page on this site, then Click the Glen Eden web link to view their Made To Order Rug Designs made in their factory in Chattanooga, TN. on their Custom Yarn Placement machines. Glen Eden has their own artists on staff to do your rendering. 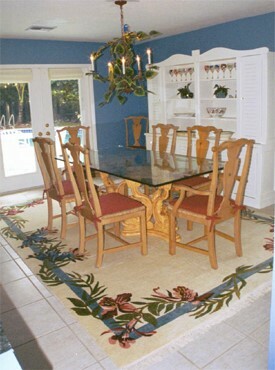 Contact Art and Rugs by Design for custom rug designs, and we will assist you with the process. Review the Brintons’ Product page on this site (COMING SOON), which features the 2016 carpet catalog with their newest designs in Axminster, Tufted, and Wilton carpets. Review the Royce Wool Carpet section in the Web Links page of this site, which features a collection of their newest designs. Next, click their web link to view a large selection of Royce’s Designs. Contact Art and Rugs by Design to see samples, yarn colors, and for all rugs including custom rugs. Review the Inner Asia Product Page on this site, which features a collection of their newest designs. Next, click their web link to view a selection of 28 Hybryd Tibetan Rugs which are in stock in America. Contact Art and Rugs by Design to see samples, yarn colors, and for all rugs. Review Hakwood Product Page on this site, and click their web link to view their stock of European Oak flooring. Contact Art and Rugs by Design to view samples of stock products or to consult for Custom Wood requests.